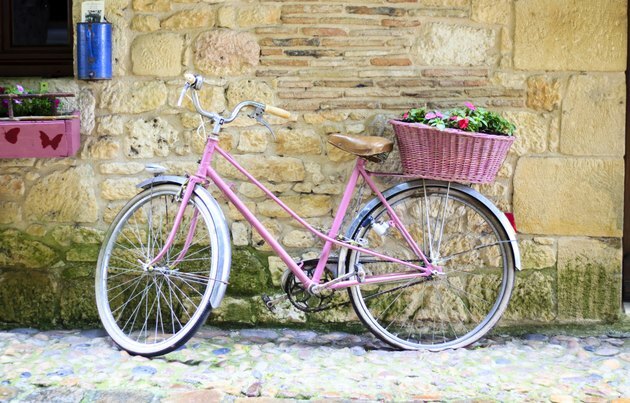 After removing the old coat of paint and stickers and sanding down your bike frame, you need to choose a type of paint that will make your bike shine. You can always purchase a 99-cent can of spray paint from the hardware store, but the results won't be amazing. You'll want to choose the right type of primer, paint and finish to optimize your paint job. You need to apply at least two thin coats of primer to attain the best results. When choosing a color for the primer, consider the final color of the bike. Also, choose a primer that acts as a rust inhibitor to protect the bike. If the metal frame is already rusty, zinc chromate is an appropriate primer to use. A special primer might be necessary if you're refurbishing an aluminum frame, since the pores in aluminum can affect the results. You won't need more than a half-pint of paint to cover the frame if you're brushing it on. Visit your local hobby shop to see if they have small containers of paint. However, spray paint will provide a more even finish than brushed-on paint. Choose a quality brand; generic brands might spray unevenly and provide less-than-optimal results. Apply three thin coats of paint, applying it in short bursts and allowing the paint to dry between coats. Make sure the area is well-ventilated, and wear goggles, a mask that will filter out paint fumes and gloves. Let the paint set for several hours or an entire day before applying a layer of clear coat. Apply three coats of clear lacquer spray or clear coat. Again, allow each coat to dry before adding another coat, and let the bike dry for a full 24 hours after applying the last layer of finish. If you're not happy with the range of colors available in spray paint, you can pick up a spray gun online or at the hardware store. You can use allmost any kind of paint with a spray gun. Spraying paint provides a more even finish and the end result looks more professional than brushing on the paint, which can leave visible brush strokes and drips.